Here’s a bouquet of Finnish spinning wheels for my international readers. They are all from museums, mostly from Ostrobothnia, the middle western coast of Finland where I live. 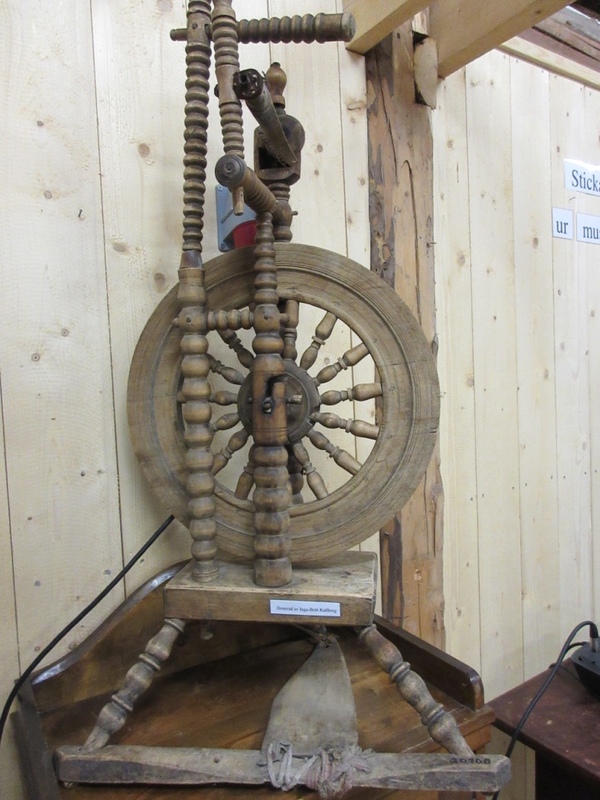 The Saxony wheel was designed to spin short, carded wool in an efficient way using the long draws. It’s not an easy wheel for a beginner, but this is what the young girls still learned to spin on. I love the smooth, wide movements in the long draw as we spin it in Finland: as long as your right arm reaches, drafted to the right without twisting your body backwards as some of the other long draws demand. First: the proper way to attach spokes. If you look closely, you see that they don’t go in a straight line, but more in a zig zag line. A Norwegian friend told me that this prevents the wood from breaking. There are usually six slightly bent parts in the wheel, forming a perfect circle. You can see a faint line in the wheel where one of the joins is. This wheel is in a museum in Vaasa. A typical wool flyer has fewer hooks than a flax flyer, and it’s wider. 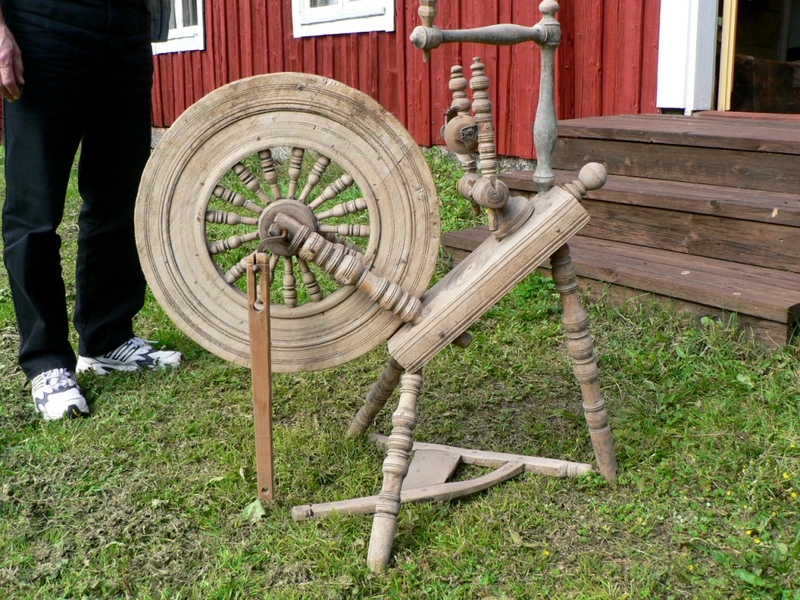 The Saxony wheels in Scandinavia were used for both flax and wool. You can spin both on either of the flyers, but thicker wool yarns tend to catch on the hooks of a flax flyer. Below a wool flyer. There’s also a skein winder with a counting train. Professional spinners always measured their yarns, as there had to be a certain length in each skein. This wheel is in use, and the spinner has secured the drive band because of all the kids that want to spin the wheel and make a mess of the band. Deep or lighter blue wheels with red details were common in my part of Finland. 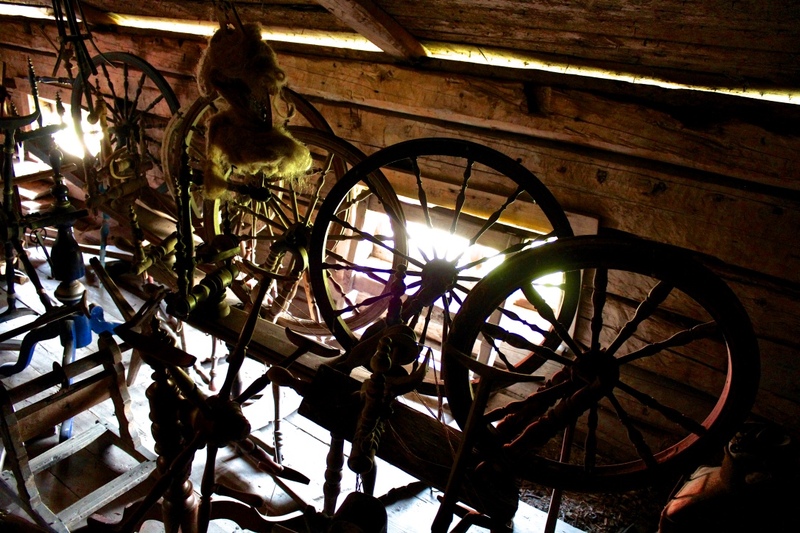 This wheel is in a museum in Taivalkoski in north eastern Finland. I don’t know if the colour was common in the Kainuu region, or if the wheel has been brought there from another part of Finland. A green wheel from Malax in Ostrobothnia. Green wheels can also be found quite often here. 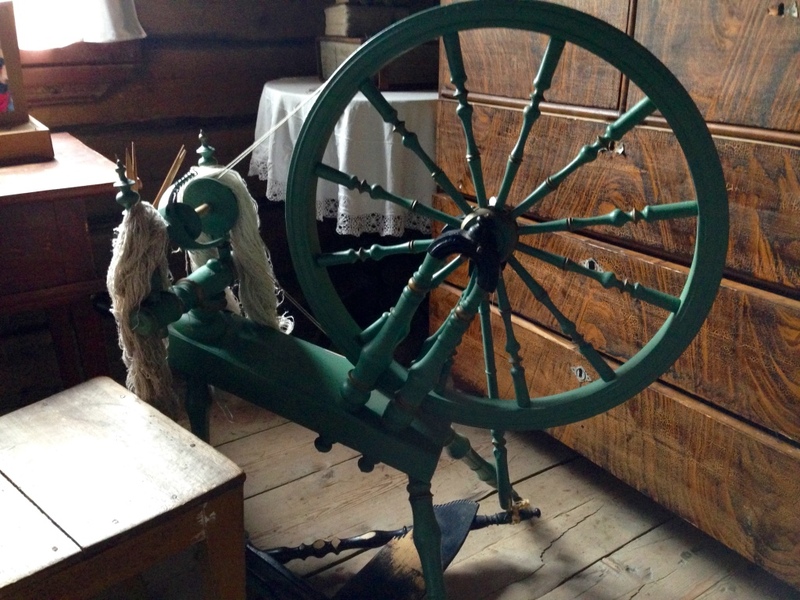 An old wheel from Korsnäs, the home of the famous Korsnäs sweater. There’s no dating, but in my eyes this looks older than the Saxonys from the late 19th-early 20th century that we have seen above. This is an old wheel. On the other side of the drive wheel there’s a carving “1739”. It seems to have been added later, but it must have some significance. Either it is the year the wheel was made, or the year the spinner got it. I love it, I think it’s very beautiful. The distaff is much newer, and the footman seems to be of later age also. The wheel is in a museum in my municipality. No, I haven’t been permitted to try it – I’ve asked 🙂 But it works, I’ve tested it that much. 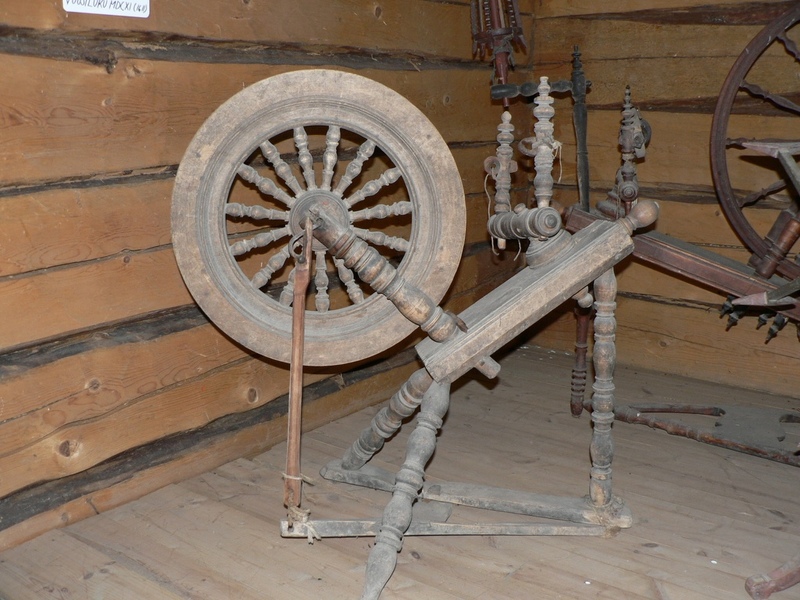 This wheel is in a museum in the Finnish speaking part of Ostrobotnia, Vähäkyrö. It’s dated 1611, but that seems to be wrong. No authorities have yet accepted the date, and the reason is that flyer wheels were almost unknown in Finland at that time. Until we know for certain, we just have to admire it. It seems to be a relative of the one from 1739 above. Strong wheel, very steep bench. The museums have so many spinning wheels, that they can’t display them all. The one above is stuffed away in a barn at a museum in my municipality. I wanted to show it because I believe this kind of wheel must’ve been common. It’s a simple undecorated wheel that has clearly been in use. How many of these have been used as fire wood, as there’s no elaborate wood turning or painted decorations? It’s just simply a tool. Now here’s a classic: a spinning wheel from Kiikka, a municipality in south western Finland that was so famous for it’s wheel production, that there’s still a spinning wheel in its coat of arms. It’s called “Kiikkalainen” in Finnish, and easy to recognise because of the way it’s decorated. I have one of these, and it’s indeed a very good Saxony. This is from a museum in northern Ostrobothnia, Kokkola. Upright wheels are very sparse in Finnish museums. There have been upright wheels earlier, but they have disappeared probably before museums became common. This wheel is in a museum in Malax, where you can also find the green Saxony above. It’s history and origin is unknown. A discussion in the Antique Spinning Wheels group on Ravelry couldn’t establish a precise region, but Germany, Netherlands, or Belgium seem to be closest guesses, much because of the wood turning style. 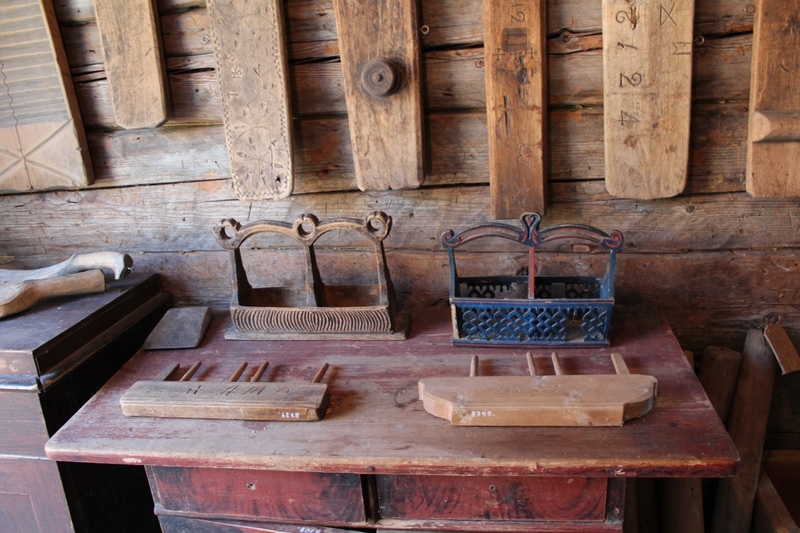 Almost every municipality in Finland had at least one wheel maker, often several. 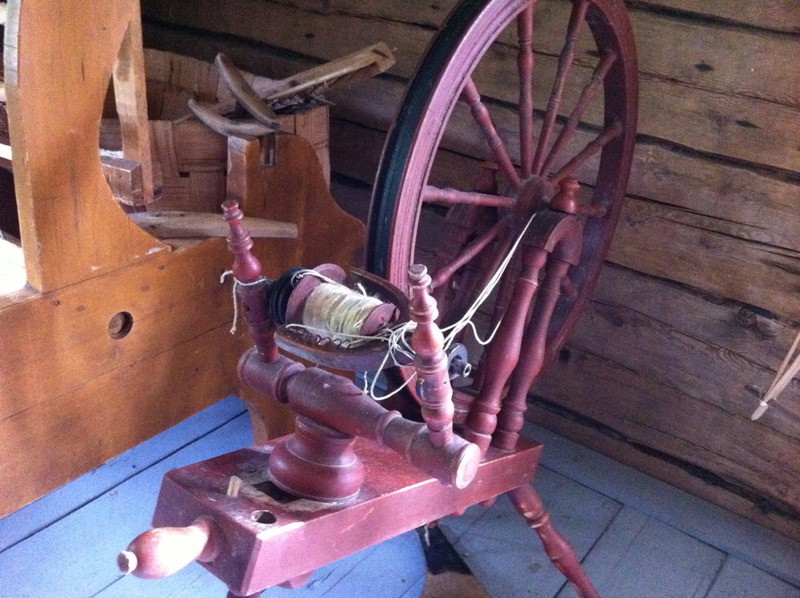 The spinning wheels were of great importance, as industrially made textiles didn’t become common until the end of the 19th century, and in many rural areas even later. All small holders and bigger farms had sheep, and flax was grown until the second world war. All women could spin, some better, some just acceptable for work clothes and blankets. So what happened? The simple question is: man made fibers. During our last wars against the Soviet Union (1939-1944) all capable men were at war. The women and children took care of everything else. I’ve heard so many of them say that after the war they put away their wheels, because they reminded them of the never ending exhausting work, when spinning was the last task late in the night when everything else had been done. The man made fibers and mill spun wool yarns saved the women from the spinning wheels and looms. Sleeping beauties beside their skein winders. Many wheels also ended up in the grandmas’ attics. Now they are often sold on the second hand market, and luckily there’s a steadily increasing number of spinners who want to use these old treasures. 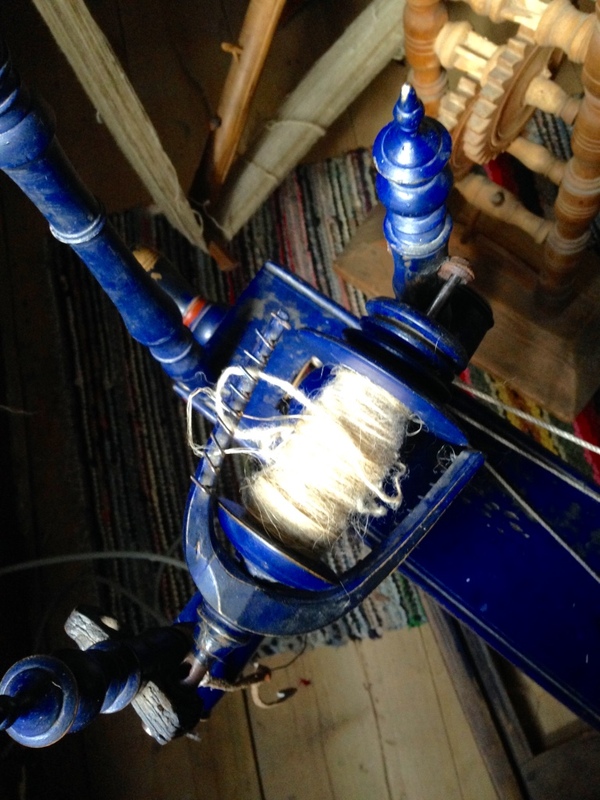 Here’s what happened next, when the spinning was done: plying yarn, making heddles for the loom. And after a while, doing the laundry and pressing the linen. This is also from my favourite museum here in my municipality. Thanks for sharing this historical information. I love the painted wheels. You seem to have so many wheels over there that are antique. The ones over here must have been used for firewood!! Yes, we have. I wonder why? October 18, 2015 - 2:16 pm Marilyn F.
Ah, what a wonderful study of wheels. Thank you so much!!!! Your comment on the slightly staggered laying of the spokes into the wheel I have not noticed before. I will from now on. And your photos of the seemingly “ancient” wheels are terrific. I will be spending more time absorbing this post. Interesting that the women put their wheels away after WWII because of the drudgery of the task of spinning during the war. You have lots of very interesting points here. Thank you. Thanks, Marilyn! Your and Rebecca’s comments on my earlier post made me look through my photos, and I thought you’d like to see the wheels. About the women putting away their wheels: there was so much work also after the war. Lots of husbands never came back, and the women still had to take care of everything. It’s impossible for us to understand how it was, but be sure it was hard. October 19, 2015 - 2:24 pm Marilyn F.
Thank you Barbro for sharing your wheel photos. I am curious why they are painted? We so seldom see painted wheels here in the US. Some of my thoughts were that it might be to brighten up the dark days of winter? Just for fun? To help preserve the wood? I have seen wheels painted with flowers and others with designs burned into the wood and they are attractive. We need to put a coat of oil and wax on our wheels each year to keep the wood from drying out. If your wheel is painted, you don’t have to worry about that. Yes, our women here also were very busy during and after the war. I was lying in bed last night trying to think of when our culture stopped spinning in the home and I am sure it varied from country folk to city folk, lasting longer in the country. It may have been between WWI and WWII, but there was definitely a lapse in production, as hand spinning had a rebirth beginning about 1970, and it hasn’t stopped. I remember a comment you made in an earlier post about how the US spinning culture was influenced by whatever area the immigrants came from in Europe or across the water (something to that effect), and yes, that is definitely true. 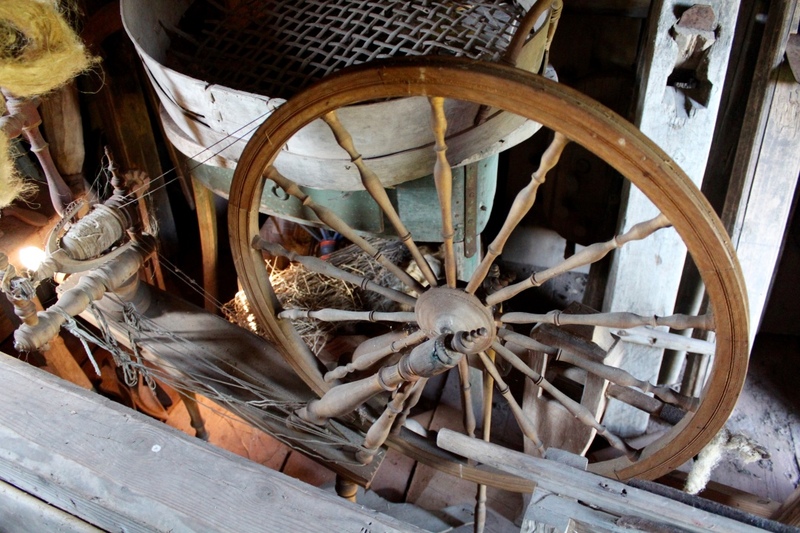 Some families still have spinning wheels that have been passed down from generation to generation. I don’t feel that is so true today, except for the pride they may have in their family history, due to the long gap we had between the wars and the 1970’s (which is now 40+ years in the past – hmmmm), and we have so many sources of wheels and spinning cultures to choose from today. We can spin on just about any style of wheel we choose, old or new, we are extremely lucky to have so many choices and spinning is much more of a LUXURY than a NEED or a CHORE for us. I have an old wheel in many pieces that I purchased for $10 at an estate sale, along with an old reel. They didn’t know what they were selling and I didn’t want to ask too many questions, as they might increase the price. Hahaha. The reel could have sold for $200 if they were aware, as it was in good shape. It must have come with the family across the water. Its very old and from a long standing family in the area. It looks like it fell from the rafters though. I thought about chucking some of it into the fire, and keeping the flyer that is in tact, but haven’t. I figure if they kept it for so long in pieces, it meant something to someone. Since retirement is not far away, I may attempt to restore it in a few years. Thanks again for sharing your knowledge and photos, it is valuable history for those of us interested in the subject. I don’t know why so many Finnish wheels are painted. It seems to have been the custom all over the country, even if you sometimes see unfinished wheels. Wheels in northern Sweden are also painted, often blue. I hadn’t thought about it until people abroad started asking about it. Anyway, I’m glad they are decorated! They often have the first owner’s initials and a date painted on the bench, which I think adds to their history and value. It’s wonderful to be a spinner now. When I started spinning in the early 80s, the situation was quite different. Only local wool, often of bad quality, no other wheels than the antique Saxonys, no knowledge about spindles, no videos, very little literature in my languages (other than English, but those were hard to find and get), and of course no videos and no internet. Things are so different now. Today I’ve worked with wool from an old Swedish breed Dalapäls, a new Swedish Merino cross breed called Jämtlandsfår, extremely rare Norwegian Grey Trondersau, Swedish Mohair, Australian black Merino, and Finnwool. I’ve been scouring and dyeing for several hours, and enjoyed it so much! So varied wools, so many different yarns to spin! Last week I dyed Norwegian NKS and British Romney. And on the Minispinner I have Australian grey Merino. 25 years ago I’d had nothing else than Finn and Finn x Texel. And I wouldn’t be talking to spinning friends all over the world. I love how new influences have come from the US the last decades! Some are old techniques that we re-discover, others are new like some of the art yarns. 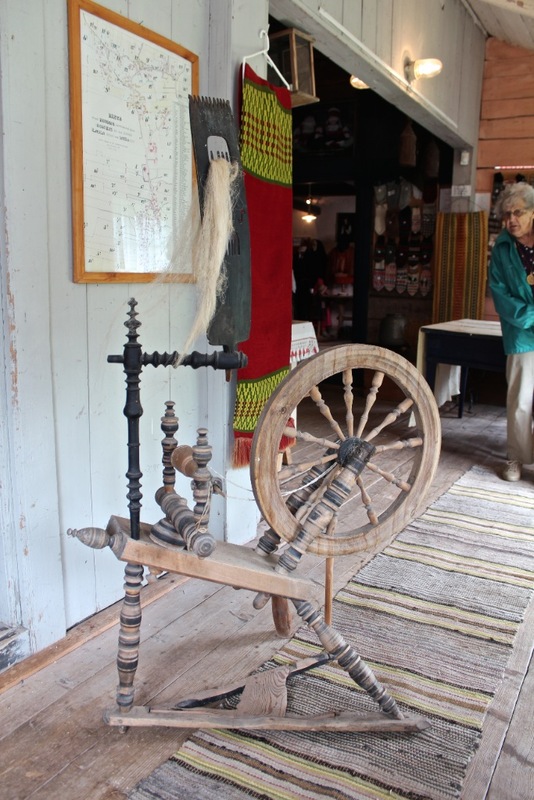 Local spinning traditions were often limited, as people spun for everyday use from a limited variety of fibers. What’s happened in the US from the 70s onward is amazing! When I started to read Spin Off in the 90s a whole new world opened to me, and I’m still learning. I’d like to see what you make of the pieces you have, Marilyn! Don’t forget to show me! October 21, 2015 - 12:56 am Marilyn F.
Colored Spinning Wheels. Amazing. I know I like the natural colors in wood, so it might be hard for me to paint a wheel unless I really didn’t like the wood. The paint may add protection to the wood from moisture, temperature change, ageing, perhaps wood pests, and give the spinner something pleasing to look at while spinning. Dating and putting names on wheels is a good idea too. Amazing that your availability and choices of fiber has changed so much over the years. It has also done the same here. For whatever kind of yarn you wish to spin and whatever color you wish to use, you can find it these days. I do remember teaching beginning spinning using some Suffolk wool and it worked fine for beginners, although not all Suffolk wool is good for spinning. Yes, the Spin-Off magazine has been a great source of information and learning over the years. I have some of the original issues that are more in a newspaper format and not a magazine. That’s going back to the late 70’s – early 80’s, I believe. I recently went through some older issues from the 80’s and 90’s and felt there was more to absorb in them than in current issues. There is not as much advertising in current issues as there was in the past, probably due to probably much more online buying today. Sounds like you have a lot of different fibers you are spinning, so you certainly will not get bored spinning one fiber on one wheel. Great! Thanks for sharing your experiences in Spinning. Yes, good thoughts! But the conditions are the same all over Scandinavia, so I wonder why the wheels in Sweden and Norway usually aren’t painted. My painted wheels are sensitive to moisture and temperature changes, but maybe not as much as if they were unfinished? Ah … staggered lying of the spokes; I have read that this was because the drive wheel was made by a wheelright – cart wheels had staggered spokes because of the weight they needed to carry and, when they transferred their skills to a drive wheel for spinning, they continued the usual practice – although the drive wheel did not need to be made in this way because it has no weight to carry. Just another slant on this? Beautiful wheels! Thanks for sharing. My cousin in Germany, after the fire, sent me a sweet little wheel I should get back from the restorer this week. It’s smaller than most I’ve seen. Will send you a picture! Can’t wait, Kris! I saw many cute small wheels in Shetland, made for small croft houses. I never knew there were painted spinning wheels. I love the way that you didn’t just present informational but ordinary pictures, but you show different details and angles, and you caught the light in such interesting ways. I especially love the one of the row of wheels in the attic. Beautiful! Sleeping beauties is right! What a treasure this post is and I’ll bet Marilyn F has drool all over her keyboard!!! She is a friend and we have talked about your postings and how much we enjoy/appreciate them. Those wheels want to make me go and buy a can of paint! Thank you again. Thank you 🙂 Your comments make me so happy! October 19, 2015 - 2:28 pm Marilyn F.
Yeah, Susan. Just let us know what color you choose. The bright blue for your walking wheel? Another absolutely amazing post. I was particularly interested in how late Finland experienced the impact of the industrial revolution and thus how strong the spinning culture was. To think of it still as a thriving skill into the nineteen forties sitting parallel to mass production, thrills me. 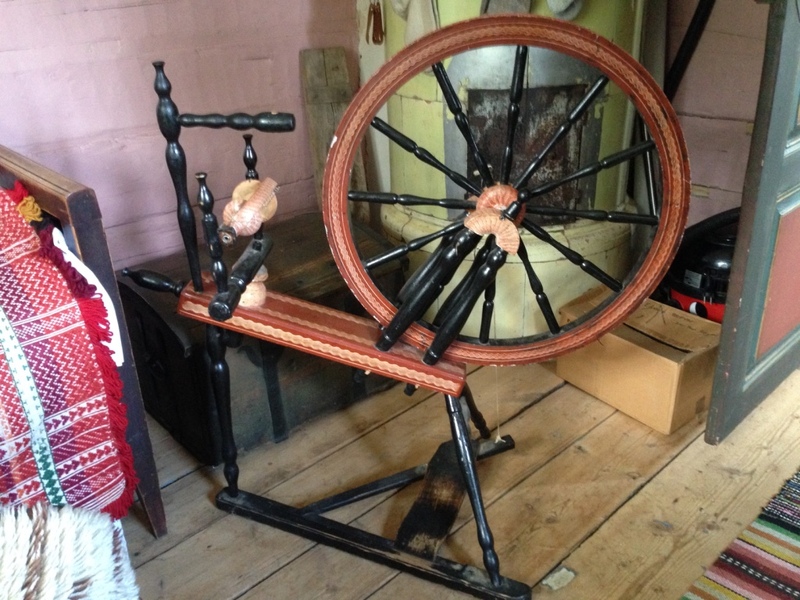 The Arts and Crafts movement in Britain in the 1880s was already trying to revive spinning as it was seen as a dying skill across much of Britain at that time. Interestingly, there are no spinning wheels in my state museum in Melbourne and only one in the Sydney museum I think. My understanding is that much of Australia’s development occurred in conjunction with Britain’s industrialisation. We imported most of our cloth from UK, never being self sufficient. Despite this our Victorian Handweavers and Spinners Guild formed in the 40s or 50s and during the seventies handcraft revival, Victoria boasted several wheel makers. Now I think there is only Ertoel Electric wheels. So many different histories and cultures of spinning behind us, and yet here we all are together via the magic of the interwebs. How extraordinary! Thanks, Rebecca! Yes, you’re right about the history. Finland was still a rural country in the 1940s, and we never had a wool production of the kind Britain had. Sheep farming isn’t easy here due to the climate. We were a part of Sweden until 1809, and under Russia until 1917, when we became independent. So we depended on others decisions about our development for hundreds of years. It’s sometimes difficult to understand that Finland is one of the richest countries in the world, a high-technology country very different from the one that I was born in. I was wondering about those very old wheels with the wide rimmed smaller wheels. To me they look a lot like the standard Dutch Saxony-style wheels. Everyt bit of wood that can be turned is turned, the wide rims, the slanted table. Maybe they came from the Netherlands originally? Dutch traders and ships came just about anywhere on the globe in those days and would trade in anyhting there was a demand for. Nice wheels you have! Yes, I think you’re right about a Dutch origin of some of the wheels I show in my post. Thanks! 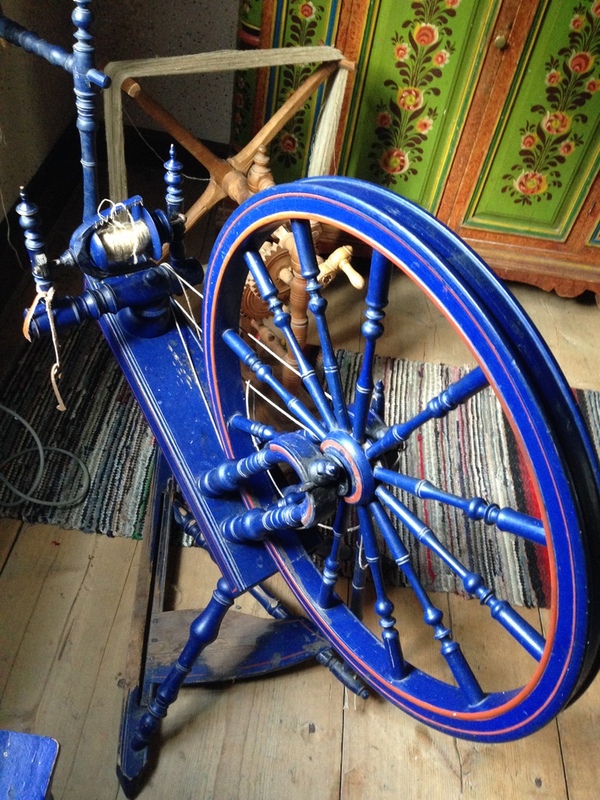 I recently became owner of a beautiful Finnish blue spinning wheel. I bought it from a dutch man who bought the wheel long time ago in Finland. It travelled with him to Germany and France and came finally to the Netherlands. Could I send some photo’s to you? Perhaps you can tell me more about it. 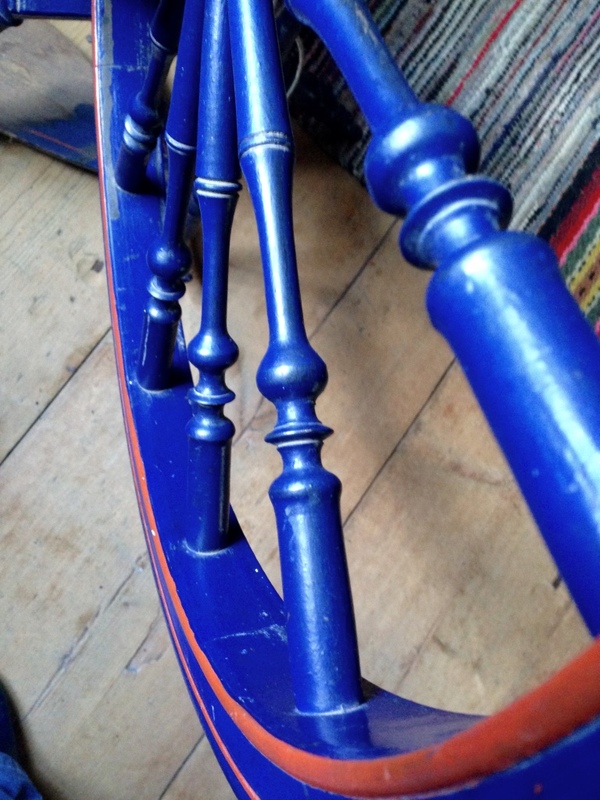 I would very much like to spin on it, it needs some repair on the footman but it is despite its more than 120 years still in an exellent shape.